When I read James Howard Kunstler’s (JHK) book The Long Emergency, it had a profound impact on me. I had been aware for many years that “running out of oil” was a serious matter. After all, I mentioned the challenge of peak oil in my graduate thesis in 1995. But my focus was more on finding a source that could replace oil as it ran out. Reading The Long Emergency was the first time it really hit me that I was missing a lot of key pieces of the picture. The book’s impact wasn’t because I thought his vision of the future was necessarily correct, but it made me think about possibilities. It caused me to look at the suburbs in a new light, and to really appreciate how vulnerable the U.S. is to oil shocks. It made me realize that problems will start to crop up – not when we run out of oil – but simply when supplies can’t meet demand. In the U.S., we built a society based on cheap oil, in which one can live 40 miles from work and drive a gas guzzler to and from work each day. As I read his book, it really sank in that this model was likely to come to an end sooner rather than later. And just as soon as I finished reading it, I got a copy of Matt Simmons’ Twilight in the Desert and read it. Those two books helped me decide that I needed to start trying to educate people about energy issues. 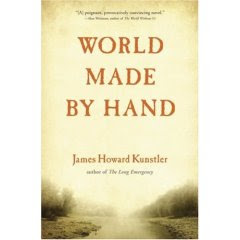 In JHK’s latest book – World Made by Hand – he shares his vision of life after oil. It’s a far cry from the future I imagined as a child; a future in which man was conquering the galaxy and we were all flying around like the Jetsons. The future JHK evokes resembles the Wild West of 150 years ago – except with a few modern touches surviving. The book is set in upstate New York (JHK’s home state) in the fictional town of Union Grove. In this world, life is very hard. There are no cars, electricity is rarely on, wars have wiped out major U.S. cities (Washington D.C. was wiped out on my birthday, 12/21), religion has made a resurgence, warlords carve out territory, and lawlessness is rampant. But communities are much tighter, the food is healthier, neighbors lend a helping hand, and people have to be a lot more self sufficient. I believe these latter aspects of the future world represents the future that JHK would like to see. As with his previous book, this one caused me to think about possibilities I had not previously considered. I spent a lot of my time pausing to evaluate whether I felt like a particular scenario was likely. I think if you accept the key premise – that no more oil is available – then the future he envisions is probably pretty close to the mark. Oil provides all kinds of conveniences that we take for granted, and I doubt the average person can appreciate how different their world would be if the taps dried up. Yet that is the world that JHK has produced in this novel. But that’s not the way I think things will play out. If you read between the lines, the book is set no more than 15 years into the future. The date is never given, but there is a mention of a woman in her 90′s who was a nurse in WWII. Assuming 20 as a minimum age, then the setting of the book is some time between now and maybe 2025 at the latest. I simply don’t believe we will lose our mechanized transport options in that time frame. On my recent trip to India, I saw a lot of people who were using very little fuel, but were still getting around by motorized transport. We have such a tremendous amount of fat that we can cut from our fuel consumption. It may be that by 2020 we do have a lot less oil available, but oil will still be available. And some countries – Brazil for instance – are not likely to run into supply issues for decades. It is hard to envision a world in which the U.S. has no more access to oil, but Brazil is motoring happily along. Even though there isn’t much mention about the rest of the world – mainly because there is little communication with the rest of the world – I couldn’t help but imagine that in JHK’s world there were a lot of countries that would have been able to maintain their fuel supplies. The book touched upon a lot of themes that I have thought about over the years. Long before I was involved in writing about energy, I was a student of evolutionary biology. One of the things that my studies made me appreciate is that modern medicine has allowed many people to contribute genes to the gene pool that centuries ago would have been cruelly weeded out by evolution. What that means is that most of us are carrying around genes that are only mildly deleterious in the age of modern medicine, but could quickly shorten our life spans without modern medicine. And in this book, JHK pulled modern medicine out from under the population. The result is as I would expect – vast numbers of people died out. I have speculated before that without modern medicine, more than 90% of the population would likely be dead within 10 years from conditions that today don’t trouble us too much. Consider your own health. Have you been hospitalized for appendicitis? How many times have you required antibiotics to treat something common like strep throat? Have you required surgery? These are all things that can kill without modern medicine. So I have a great appreciation for modern medicine. When I go to a developing country like India that’s one of the first things I think about: Do the people have access to modern medicine? Another theme that I have thought a lot about – and that JHK tackled in the book – was mining of the municipal dumps. I have often thought about the amount of metals, useful plastics, and just various odds and ends that would be of enormous benefit in a resource-depleted world. I have no doubt that regardless of how the future plays out, there will come a time that we are mining the dumps regularly. One thing that I haven’t discussed yet is the story itself. I really didn’t expect much from the story. The real story for me was what a world without oil might look like. But the underlying story was actually pretty good. The characters are really interesting, he makes the relationships interesting, and he throws a few surprises into the mix. I have to hand it to JHK – he tells a good tale. Some of the characters (and names) seemed a bit over the top, but otherwise I found myself wanting to know what was going to happen next. So I got a bonus in that aspect. If you are like me, and you enjoy thinking about possibilities (good or bad), then this book is definitely food for thought. If you want to remain oblivious to the threat of peak oil, or are otherwise convinced that technology will enable the status quo to remain, then you probably won’t care for it (although again the book is worth a read for the story itself). Good-Bye, Cheap Oil. So Long, Suburbia?